JAKOLOF BAY — Deep in this crescent-shaped bay — beyond the public dock and the oyster farms, beyond the high, rugged cliffs along the southwestern beach, beyond even the ruins of the old logging camp — I stumbled recently upon a puzzling scene: scatterings of dead jellyfish flung far ashore, well beyond the usual high-tide mark. A more thorough examination began to clarify the situation. Although a ghost forest is the demarcation line separating the mouth of Jakolof Creek from the head of the bay, that line is not historically static. The creek mouth once lay perhaps a quarter-mile farther into the bay but shifted dramatically when the Great Alaska Earthquake struck on March 27, 1964. The quake dropped the muddy, spruce-studded stream banks several feet, allowing for periodic flooding of a triangle of land that quickly became a salt marsh. Because of this sudden subsidence, the old end of the stream channel now appears only at low tide and regularly overflows its banks during tides higher than 18-20 feet. On the highest tides of the year, the ocean inundates the entire delta. Patches of goose tongue and sedge and the trunks of phantom spruce are submerged, and species of vulnerable marine life, along for a ride on the tide, later find themselves abandoned by ebbing waters. It was at low tide in mid-November when I strolled across the delta after two of the highest tides of the year (22.9 and 23.1 feet) and just before another whopper (22.7 feet). As I wandered among the drooping amber stalks and danced around the biggest mudholes — in some cases more than a hundred yards from the exposed stream channel — I discovered ribbons of kelp and dozens upon dozens of jellyfish in virtual dry dock. I found them flattened, rimed with frost and semi-transparent, their delicate insides showing through the veneer of their even more delicate outsides. Some had warped as they collapsed around clumps of grass or found themselves draped over rocks or clumps of driftwood. Most were sea nettles and moon jellies, although I spotted at least one lion's mane and many other mangled specimens I couldn't identify with certainty. As my breath clouded the cold afternoon air, I pondered whether I was witness to a large-scale cryosleep — some preliminary to a massive jellyfish rebirth — or a widespread planktonic graveyard. 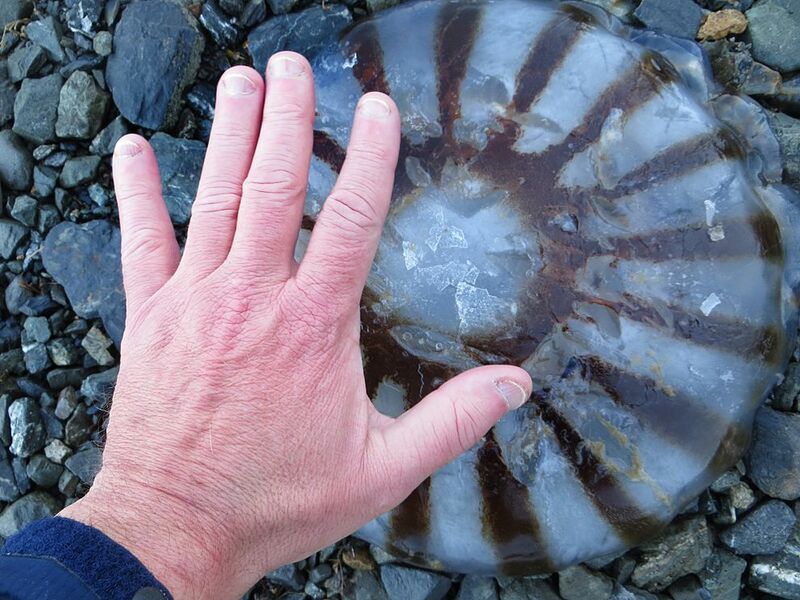 Since jellyfish have an efficient but weak propulsion system, it's common for some to be stranded on the beaches of Kachemak Bay and Cook Inlet after every high tide. In fact, when the conditions are right — when huge tides combine with high winds to create a storm surge, for instance — the jellies' feeble internal pumping mechanism cannot compensate, cannot steer them from disaster, and sometimes the marooned creatures can be found in clumps along the high-tide margins. Typically, stranded jellyfish quickly become desiccated between high tides and die before the returning saltwater can reclaim and rehydrate them. Even if they could remain hydrated, they stand a poor chance of survival since the rough action of being beached plays havoc with their fragile bells and dangling appendages. However, jellyfish are so numerous in the ocean, and so prolific, that no hue or cry is raised, even when they die by the thousands. Still, I must admit that I found myself rooting for these jellyfish. I wanted them to survive somehow, to simply be in a state of suspended animation. Perhaps they would be revived and carried to safety on the next big tide, or the one after that. Barring that, I hoped they would die for some greater good. I wondered whether anything fed on stranded jellies. Although gulls had been cruising the length of the bay, I had seen none of them swoop down to feed on jellyfish carcasses. Maybe consuming a creature made almost entirely of water wasn't worth the calories burned in the effort. Maybe, in fact, the jellies were better as fertilizer than food. 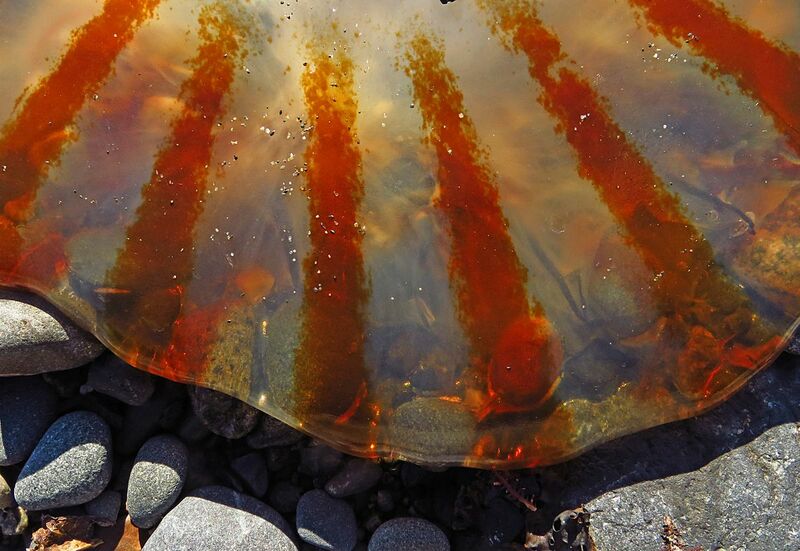 After my water taxi ride back to Homer, I did a little homework, both online and by visiting the Kachemak Bay Research Reserve and the Center for Alaska Coastal Studies, and I decided that the stranded Jakolof jellies had almost zero hope for resurrection. Their fragility, their susceptibility to the whims of strong currents, and the relative dearth of jellyfish sustenance during the winter months make their survival a difficult proposition. In other words, it may just have been their time. 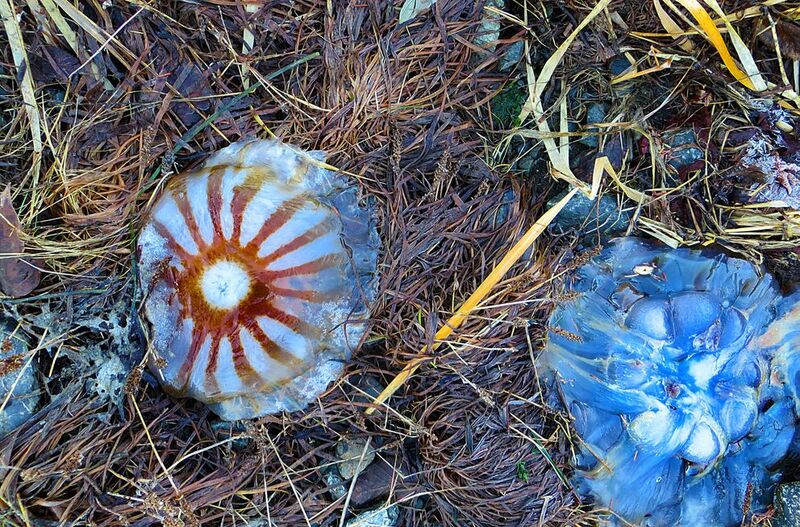 I also learned that jellyfish — considered highly effective predators, and occasionally cannibals — are seldom eaten by the marine denizens of Kachemak Bay, but they are consumed avidly by humans in China and Japan. Meanwhile, scientists worldwide have focused research attention on jellyfish. They have studied jellies for medical, cosmetic and genetic purposes, producing surprising results in bioluminescence, aging and cancer research, among other fields. But it is hard to contemplate scientific advances when traipsing through a gelatinous graveyard. 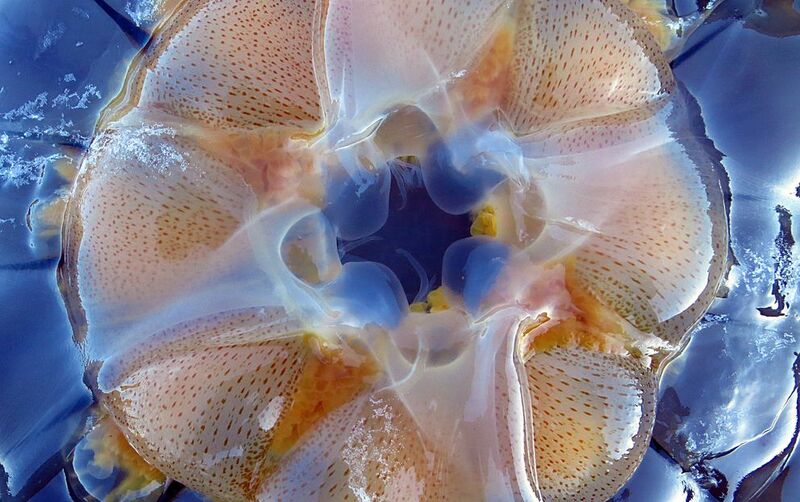 All those intricate patterns, all that see-through anatomy — beautiful even without the pulse of life. And I'd still like to think that after I walked away and the tide rushed back in, the stranded jellies — a few of them, anyway — were granted a temporary reprieve, some sort of Scyphozoan renewal. Clark Fair, a Kenai Peninsula resident for more than 50 years, is a lifelong Alaskan living in Homer.